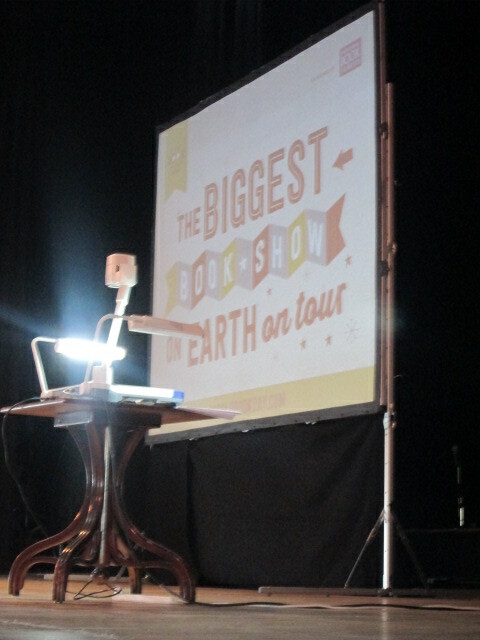 When The Biggest Bookshow on Earth On Tour dropped by at the King George’s Hall in Blackburn earlier this week, writewyattkuk was there to savour the atmosphere. While cynics might suggest it made perfect financial sense to invite some of the UK’s top children’s authors out into the country to mark World Book Day, those behind this ambitious roadshow venture deserve credit and recognition for helping spread the word about a thriving art form. 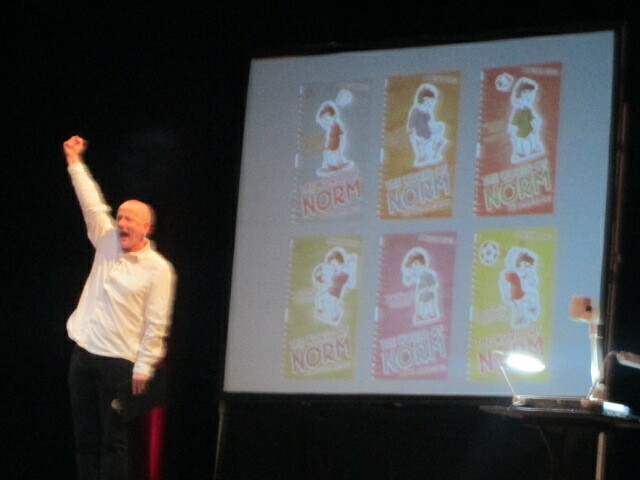 And for me, the true success of The Biggest Bookshow on Earth On Tour can be measured by the fact that more than 1,000 Blackburn schoolchildren happily hung around to have their books signed and meet their new literary heroes. We’re all led to believe that today’s kids don’t read, and books are something they might download but then quickly dismiss in favour of the latest app to die for. But what I saw at the King George’s Hall on Monday flew in the face of that, and in fact doubled as something of a weighty slap aimed at those responsible for the Government cuts and policies that have led to a rash of recent library closures and educational curbs. Furthermore, one of the leading lights in getting this promotional event to Blackburn in the first place is an independent bookseller from Lancashire, and one happily bucking the commercial trend. SilverDell of Kirkham has a proud record of book signings and public appearances. And just getting this roadshow visit to happen must have involved a few headaches and sleepless nights. 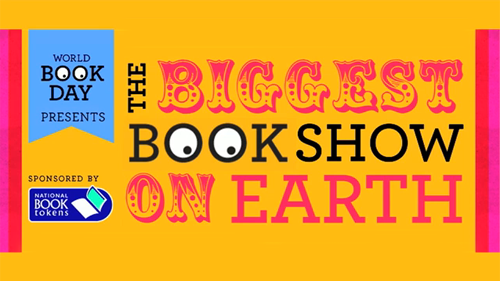 It helped of course that so many big names in children’s fiction were involved, The Biggest Bookshow On Earth On Tour including Cathy Cassidy and Lauren St John for this date alone. Cathy, along with fellow Blackburn visitors and bright young things Laura Dockrill and Alex T Smith, also took part in a related event in Newcastle-upon-Tyne three days earlier, successfully co-hosted by the Seven Stories national centre for children’s books. And the merits of working under this umbrella organisation are neatly underlined by the fact that Cathy’s previous World Book Day exclusive Bittersweet was among the UK’s top 100 best-selling print publications in 2013. 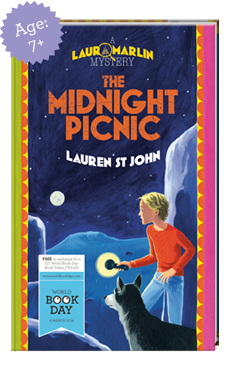 And that’s something Lauren St John would no doubt be proud to replicate this time around with her Laura Marlin spin-off, The Midnight Feast, one of the latest £1 offerings. If I was in any doubt that I was close to the venue as I braved the Blackburn one-way system and major roadworks on the way in – with the start time fast approaching – a coach passed me carrying at least 50 young Where’s Wally? lookalikes. Those weren’t the only audience members looking the part either, a quick glance around revealing that plenty of pupils and teachers had donned costumes to mark the book character theme in this packed, impressive East Lancs venue. 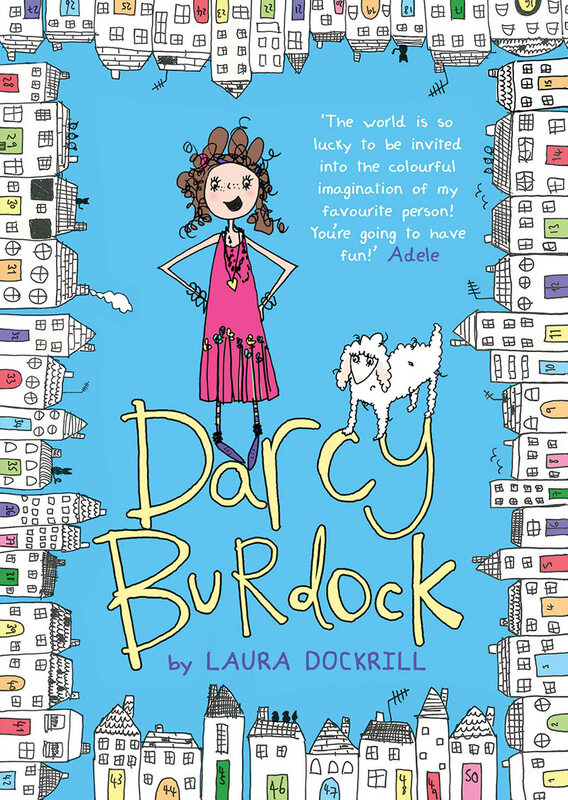 First on was Darcy Burdock author, artist and celebrated performance poet Laura Dockrill, who classes herself as ‘writer, illustrator and person’. And she certainly proved personable in her compere role, this perfect host getting into the flow with an impassioned reading, involving plenty of vocal animation. Forgive me for not being more specific, but there were a few teething problems with the sound at that point, the PA system only seeming to come into its own about two-thirds of the way through the live performances – possibly something to do with the Radio Lancashire radio car trying to simultaneously broadcast from the venue car park. But Laura gave it her all, reeling in this mix of year five, six, seven and eight pupils before the first of her introductions to fellow guests, telling them how Alex T Smith had always wanted to be a rabbit when he grew up. At least I’m pretty sure that’s what she said. 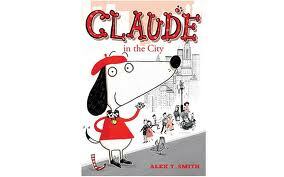 That broke the ice, and on bounded Alex, soon endearing himself to his audience with a few step-by-step illustrations, picked up on a projector, showing how he sets about bringing his main character, Claude, to life. I should hate him of course. Not only is he talented and charming, but he’s also still in his 20s yet already in print and doing well for himself. But such is life. Either way, I reckon he’s got a long, successful career ahead of him. That said, young audiences are there to trip you up, and while it made sense to describe Claude’s beret as a ‘floppy sausage’, there were too many boys around to let that go, with plenty of sniggering going on out there. Pretty soon, Alex had zipped back off again, the applause still ringing out as he made way for the returning Laura, a clear natural when it came to this Live at the Apollo style approach to bookshow compering. And this was ‘children’s lit does stand-up’ at times. Laura soon cajoled Lauren St John on to the stage, and while the acclaimed Laura Marlin, One Dollar Horse and White Giraffe author looked a little less relaxed with a big crowd at first, she too warmed to her task. Again, despite the sound problems, Lauren gave us an admirable potted history of her writing career and back story, from her formative farm days in Zimbabwe and self-evident love of animals onwards. 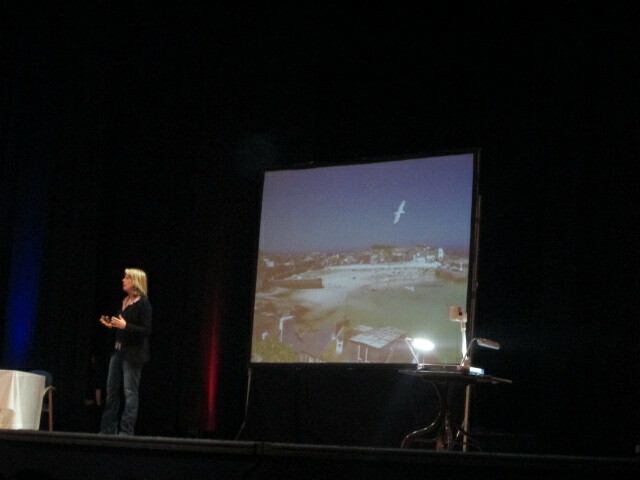 Her accompanying picture show included a slide of her beloved St Ives, Cornwall, where the first Laura Marlin mystery unfolded. But it was the wildlife slides that got the biggest response, and at least twice she was drowned out by a surge of ‘ooh’s and ‘aah’s as she flicked to cute images of cuddly tiger cubs and the like. And those that later queued to get books signed by her proved the winning impression she’d made. Lauren left on an inspirational note too, highlighting her mum’s advice to follow your dream, telling us how you can get there if you work hard enough, whatever your background, and – judging by her own experience – however far removed you might seem from the wider world initially. Our host, Laura, then introduced the next guest, Curtis Jobling, remarking on his love of Mr Benn and noting a supposed similarity between the two. And Curtis, in a sense like that celebrated TV shopkeeper, was soon giving illustrated examples of his many guises over the years, picking out his ‘life in crayons’. He, like Alex, gave crowd-pleasing live examples of his artwork, setting out the many phases in Curtis’ life, from childhood to student and beyond, the only similarity in each picture the ever-present crayons in his hand. This Warrington-based illustrator of CBBC hits Frankenstein’s Cat and Raa Raa the Noisy Lion talked a little about his TV work too, with general murmurings of recognition for his characters giving rise to a major dawning as it became clear that he was also the creator and pensman of a certain Bob the Builder. What followed was a quickfire selection of live drawings of Bob, Wendy, Pilchard and Spud, a pantomime air added to the latter’s depiction, the assembled kids ever-more wild as Curtis ‘forgot’ to add the scarecrow’s nose. His was a hard act to follow, but there was enough love out there from the older girls for Cathy Cassidy to get by on, the best-selling Chocolate Box series author taking on where Lauren had left off, confiding the various inspirations behind her stories and the craft of story-telling. Cathy, always so natural and genuinely approachable, also found – not for the first time – that her greatest bonding exercise was to let on how she was a bit of a day-dreamer at school, something a fair proportion of her audience – boys, girls and a few pesky adults too – could easily identify with. She also spoke of her need to take notes wherever she was – because written and visual ideas come at all times – and didn’t just give a plug for the good old-fashioned notebook, but her new love too, Instagram. 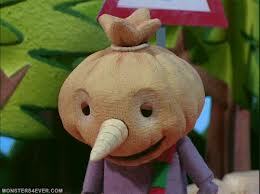 If we were wondering why Jonathan Meres was last on and therefore ‘top of the bill’, we soon discovered why. From the moment Laura mentioned the tears on his pillow as a child the morning he woke to realise he wasn’t actually the first man on the moon and it was just a dream, we were sold on this rampant ball of human energy. 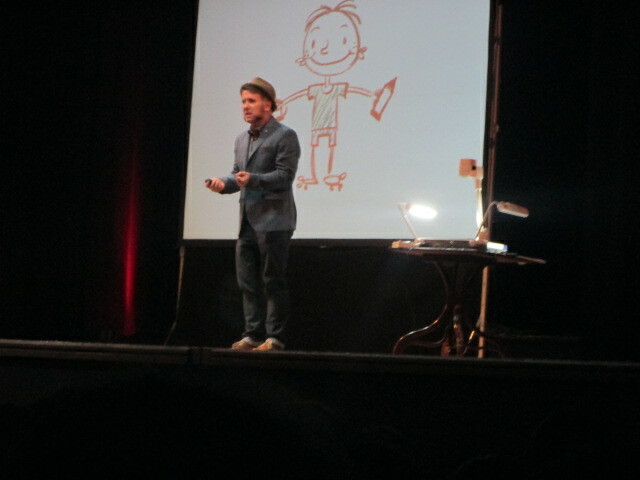 The actor turned author was clearly buzzing, taking that analogy of ‘stand-up children’s lit’ to the max. And from his husky voice-over introduction onwards, the kids were as good as rolling in the aisles and the stalls, as gag followed gag. His young audience loved every minute, Mr Meres sending himself up as well as many others, including a mickey-take of faux gangster teenagers in the playground who actually turn out to be dead posh when they get home. Jonny’s biggest laughs followed his mock-horror at being likened to Roald Dahl’s BFG, and as well as a few subtle lines to keep us adults amused, he further endeared himself to the schoolboys present with a few fart jokes. More to the point, he engineered a perfect pitch for his The World of Norm series, and you can’t help but understand why so many kids were feverishly queueing to see him a few minutes later. 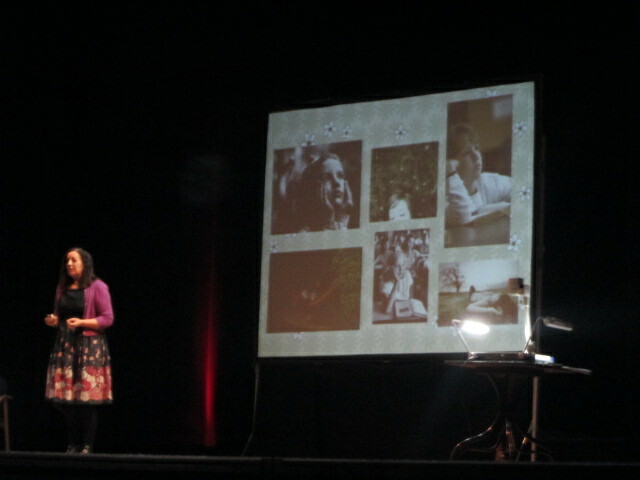 Before that, Laura returned and invited all her fellow guests to take a bow, the guest sextet then heading down to the tables in front of the stage to get on with the dedication-scribbling section of the roadshow. By the time I left, Cathy Cassidy was last woman sitting, her hands aching from another major signing session. But her fellow stars also put in the hard labour, and looked shattered by the time they departed. At one point I saw a look of horror on Lauren’s face as she realised just how much Laura was writing in her own dedications. But whatever their chosen methods, it’s fair to say that there were plenty of smiling faces on both sides of the tables, and lots of new fans recruited by each and every author. The decision to take The Biggest Bookshow on Earth out across the UK was clearly a great idea, and long may it continue to happen. And Elaine, Sue and fellow organiser Jake Hope can definitely reflect on a job well done, after an exhausting but truly successful venture that proved children’s lit is definitely here to stay. 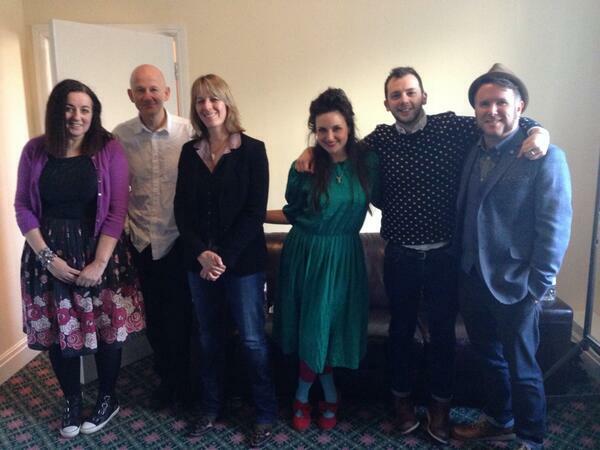 * For more news about World Book Day events, head here. * And keep looking out for writewyattuk in the run-up to an interview with Lauren St John tha twill soon appear on these pages. This entry was posted in Books Films, TV & Radio and tagged Alex T Smith, Biggest Bookshow on Earth, Blackburn, Cathy Cassidy, children's fiction, Curtis Jobling, Jonathan Meres, Laura Dockrill, Lauren St John, World Book Day. Bookmark the permalink.